The rhizome with leafstalk of Dryopteris crassirhizoma Nakai of family Dryopteridaceae. Mainly produced in the mountain area of Heilongjiang, Jilin and Liaoning provinces which is usually termed as Dong Bei Guan Zhong or Mian Ma Guan Zhong. Special fragrant smell, bland and slightly astringent taste with after-taste of bitter and pungent. 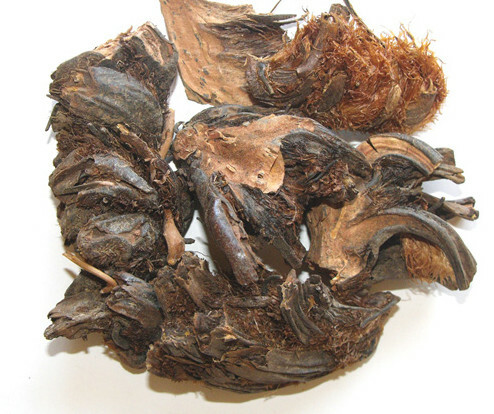 Dried after cleaning and getting rid of learstalk and fibrous root, sliced and used without preparation or parched to charcoal for use. Pungent, cold, slightly toxic; liver, lung and stomach meridians entered. Clear heat and remove toxicity, cool blood and stopping bleeding. A. Common cold due to wind-heat, macula due to epidemic toxicity, mumps with swelling pain. It can clear excess heat in qi system and remove heat-toxicity in blood system as well. 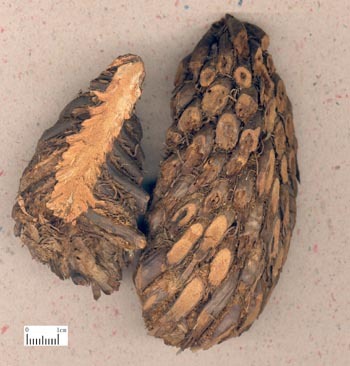 All syndromes of common cold due to wind-heat or epidemic toxicity can be treated or prevented with this herb. For common cold due to wind-heat or warm disease in stage of pathogen stays in qi system, it should be combined with wind-heat-dispersing herbs such as Niu Bang Zi and Jin Yin Hua so as to expel pathogen outwards. For example, it is combined with Jin Yin Hua in Kang Gan Ke Li from Pharmacopoeia of the People's Republic o f China published in 1995. For warm disease in stage of heat entering nutrient-blood, macula due to epidemic toxicity and difficult in promoting small-pox eruption, it is commonly used for its actions of clearing heat, removing toxicity, cooling blood and stopping bleeding, and it is often combined with toxicity-removing and blood-cooling, macula-removing and eruption-promoting herbs, such as Xuan Shen, Da Qing Ye, Shui Niu Jiao and Sheng Ma, etc. For instance, it is combined with Chi Shao and Sheng Ma in Kuai Ban Tang from Xiao'er Yao Zheng Zhi Jue. For mumps with red swelling and pain, it can be combined with heat-clearing and toxicity-removing herbs, such as Niu Bang Zi, Lian Qiao, and Qing Dai, etc. Either oral or topical administration is appropriate. With the action of cooling blood and stopping bleeding, it is indicated for blood heat syndrome manifested as epistaxis, hematemesis, hemafecia, and metrorrhagia and metrostaxis. For hematemesis, it is combined with Ce Bai Ye and Xue Yu Tan, as in Guan Zhong Tang from Wan Bing Hui Chun (Rejuvenation of Thousands of Diseases). For sudden heavy hematemesis and hemoptysis, it is combined with Huang Lian, as in Guan Zhong San from Sheng Ji Zong Lu (Complete Record of Holy Benevolence). For dysentery and hemorrhoidal hemorrhage, it is combined with She Xiang, as in Jing Xiao San from Pu Ji Fang ( Universal Aid Prescription). For severe nasal epistaxis, it is used singly in Ben Cao Tu Jing. Because it can contract uterus markedly, it is good at treating gynecologic bleeding syndrome such as metrorrhagia and metrostaxis due to blood heat. It is combined with Pu Huang and Dan Shen in Ben Cao Hui Yan. It is effective to treat functional uterine bleeding, postpartum hemorrhage, abortion and bleeding after induced abortion at present. In addition, with the action of clearing heat and removing toxicity, it can also be used to treat sores and abscess due to heat-toxicity, burn due to hot liquid or fire, leucorrhoea. Decoct 5~10g. The raw product is used for clearing heat and removing toxicity while the one stir-baked to charcoal is for stopping bleeding. Proper dosage is for topical administration. Since it is slightly poisonous, overdosage should be avoided. Oily food is prohibited while taking this herb. It should be used cautiously to pregnant women.